● Training – Transfer of knowledge from our experts here at Rev.io to our client, pertaining to the software products we provide, in the form of a Webinar, Onsite Training, Office Visit, Conference Call, etc. 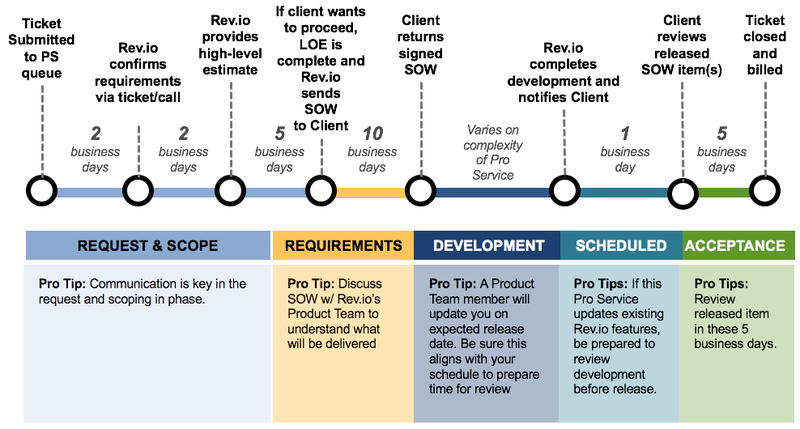 ● Consulting – Transfer of knowledge from our experts here at Rev.io to our client, pertaining to anything outside of what our software provides, but related to the industry business or efficiency. ● Software/Product Customizations – Requests for new features, changes to existing features, or special business rules/workflows for any of our standard software products. Not all customization requests will be approved and may be reviewed by our Product Team to determine if the requested change aligns with our mission to be the best billing and back office software in the world. ● Integrations – Requests for new integrations, changes to existing integrations, or special business rules/workflows for any of our standard software integrations. Not all integration request will be approved and may be reviewed by our Product Team to determine if the requested integration aligns with our mission to be the best billing and back office software in the world. ● Task Automation – Setup of SQL Jobs and/or Services to automatically run queues or other batched tasks that would otherwise require human intervention within our software. ● Reporting – Creating reports produced by our software products regardless of difficulty or means of construction. ● Advanced Technical Assistance – Helping clients through non-error related complex tasks in our software or performing some of the steps for them (i.e. rebilling an account for several months, reversing statements for many accounts, rerating usage for many accounts, direct database modification or querying, etc.). ● Manual Processes – Requests to perform any task that could otherwise be done by our client in our software, but because of lack of resources on their side or lack of time, is unable to be accomplished by our client. ● Data Conversion – Requests for data migration from one database to another or data conversion for import into a Rev.io database, after the Implementation process has been completed.